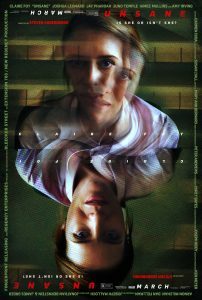 In UNSANE, Leonard plays a stalker who appears to be working as a meds-dispensing orderly in a mental institution where heroine Claire Foy has been committed against her will; see our review here. Like the bulk of BLAIR WITCH, UNSANE was shot digitally—on an iPhone 7. However, Leonard notes, “There are as many differences as there are similarities between BLAIR WITCH and UNSANE,” starting with the fact that whereas the former was improvised, the latter was fully scripted (by Jonathan Bernstein and James Greer). “BLAIR WITCH always felt like a bunch of teenage kids getting together in their mom’s garage and making a punk album. I believe that’s part of the reason the film worked; we were figuring out everything as we went. It’s a very different experience making a movie with Steven Soderbergh—not only because it’s scripted, but you’re working with somebody who’s a master of his craft, with a specificity of vision that I can’t even aspire to having in my lifetime. Leonard just wrapped a project with another well-established auteur: DEPRAVED, the variation on the Frankenstein legend written and directed by Larry Fessenden (see first details here). The film also stars David Call as Henry, a former military surgeon who makes a monster (Alex Breaux) in a Brooklyn lab with the help of Leonard’s character. “I play a guy named John Polidori [after the British writer who penned “The Vampyre” during the same Swiss getaway where Mary Shelley wrote FRANKENSTEIN]. It’s interesting, because I just realized that in DEPRAVED, I’m playing a guy who works in the pharmaceutical field, and not a great guy. So it’s another role with the pharmaceutical industry being a backdrop bogeyman for the story, which is an interesting parallel with UNSANE.